During a session, we are able to isolate approximately 30 muscles of the face. By stimulating muscle fibers with low electrical impulses, we are able to restore proper tone to the facial muscles. In most cases, after 12-18 visits over 4-6 weeks, the ‘face lift’ effect can be maintained with a session every 1-3 months. Facial toning is not intended to replace cosmetic surgery, but is an attractive alternative for those who want to take a more conservative approach to looking younger. The Ultrasound Facial employs ultrasound frequency to gently exfoliate dead skin cells for a cleaner, healthier complexion without redness, swelling, or irritation commonly associated with Microdermabrasion. With regular treatments, wrinkles and fine lines are diminished by stimulating the production of collagen & elastin. 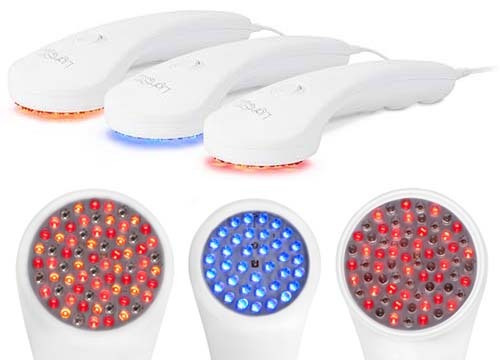 A highly technical non-invasive form of light therapy affects your skin tissue while being absorbed by cell particles and causing a positive enzyme-promoting reaction. Collagen and elastin are restored and stimulated during this treatment. Stimulate cellular turnover and collagen growth, reduce fine wrinkles, improve the texture of your skin, skin tone and the color of your skin. The proper peel for each client is determined by your skin rejuvenation therapist and is based on your individual needs. Our natural skin wellness program has been designed to achieve maximum results. We utilize technology and products which integrate highly potent anti-oxidants with organic ingredients without the use of chemicals, acids or parabens. It is designed to work with all skin types, including post-treatment skin and skin which has been irritated by aggressive treatment regimens. Celebrity makeup artist, Emilio Uribe includes IMAGE Skincare in his arsenal of red carpet products and has been raving about us on Instagram. His celebrity clients include Rihanna, Kelly Lynch and Alejandra Espinoza.